Two days before a two-week vacation and I’m in a strawberry field, bent over bushes and brushing baby spiders off the leaves, shooing away the daddy longlegs in order to pluck the ripest berries. One day before my children and I begin an 18-hour road trip and I’m in the kitchen with my girl, cooking up pots of hot, sticky berries, ladling the bubbling mixture of sugar and pectin and fruit into jars, steaming up the windows in the middle of July. Twelve hours before we leave, Chaja and I sit at the kitchen table with our feet propped on chairs, drinking tea and conducting an impromptu taste test between sun-dried strawberry jam and peppered strawberry jam. We decide the sun-dried jam, which is briefly boiled, spread in shallow pans, then placed in the sun to thicken, tasted brighter, had a thinner syrup and more intact berries and would be delicious over ice cream or yogurt. 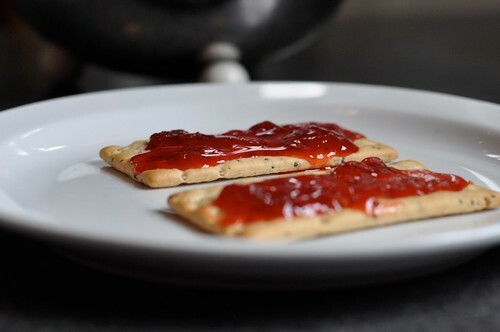 The peppered jam, with its thicker texture and hint of heat, should be paired with peanut butter. Some would argue that my motions were misplaced, but I believe that somewhere time can be found to pick out clothes and pack a suitcase, while sweet strawberries and a daughter’s interest in jam-making must be preserved. Yum!!! Sounds scrumptious…amazed you found enough sunshine to sun-toast the jam! My sister just wrapped up some jam-making back East and I can’t imagine what it must have been like boiling up everything in their current tropical temperatures. Enjoy your jam and your jam-packed trip. I had to move my jam to capture the sunshine, so maybe it got two hours of direct light and heat, but, heh, you take what you get in Seattle, right? Loving your play with fruit and with words. 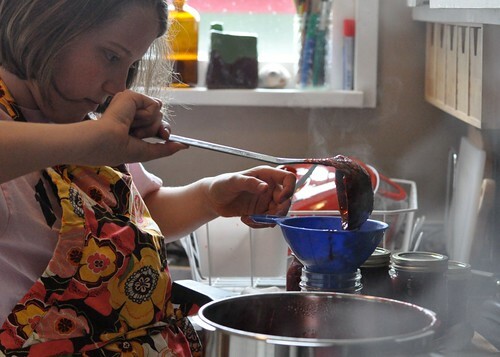 “Preserving your daughter’s interest in jam-making” is quite delicious, and you are a lovely Mum to prioritise the loving, gentle activity of jam-making over packing. I’m sure the trip will be bound to be wonderful. You already sound full to the brim of love. Sounds wonderful, and, yes: Seize the moment! You’ve got all your priorities perfectly straight. I don’t think anything was misplaced. Good choices. I like the concept of each jam. Both the sun-dried method and pairing strawberry with pepper are new to me. What type of pepper did you use? I hope your road trip is memorable and inspiring. It all spells glorious slow giddy summer to me. How delicious your jam looks. So red and tasty. Wish I could share my jam with all of you! Denise, I used just freshly ground black pepper.